The Long Way to a Small Angry Planet is just as wonderful as everyone says that it is! I can almost guarantee that you will see this book on my favourite books of year list. There was so much to love about this one from the writing, to the plot, to the characters. This book opened by eyes that I love feel-good science fiction. I want to read all of the books that exist about an electric group of charming characters travelling through space. I got such Guardians of the Galaxy vibes from this book and I loved every single second of it. It also had a similar sense of humour as Guardians and it was an absolute joy. The world that Becky Chambers creates was extraordinary. It was so refreshing to read about all of the different alien races and cultures. It was a joy to read about the characters navigating the differences between them. The characters where really the highlight of this book for me. They were each charming and unique and I have a soft spot for them all! If you are someone who has never read SciFi, I think that this is the perfect book to introduce you to the genre. The world-building is fantastic, it is diverse, and the characters are memorable. I want to put this charming novel in the hands of absolutely everyone! 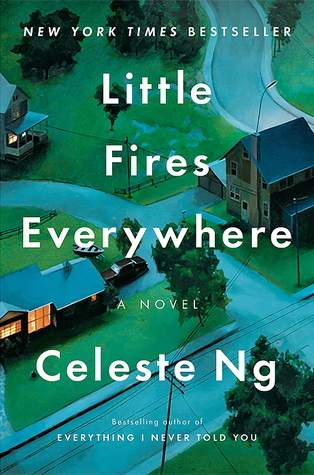 Little Fires Everywhere is a book that I have been seeing everywhere and is being turned in to a miniseries produced by Reese Witherspoon, but sadly I felt myself let down by it. I have come to the realization that there is something about Celeste Ng’s characters that I do not get along with, but it is definitely a me thing. I enjoy unlikable characters, but they have to have some depth and layers. Most people are not all good or all bad, and that is what makes them interesting. In this book I really struggled to find any redeeming qualities in any of the characters. Mia was the only character I felt any connection to, and I absolutely loved the part of the story where we learned about her past. I wish there was more of that! I also wish the story focused more on the adults as opposed to the teenage characters. I also didn’t quite understand the motivation for a lot of the characters and the actions a lot of them take seemed a bit extreme and unrealistic. I thought that the plot twists were interesting, and there were definitely some jaw-dropping moments that I did not see coming! It was because of these twists that I enjoyed the second half of the novel much more than the first half. The pace really picked up and we got to know a little more about some of the characters. I also really appreciate some of the topics that this book takes on such as mother/daughter relationships, adoption, and race. I thought that the setting for this book was amazing. I really loved the juxtaposition between the perfect setting and the imperfect characters. While there was a lot that did not work for me with this book I completely understand why so many people love it and I am still happy that I read it. I think it will make for an amazing TV show! Hanging over the porch of the tiny New England bookstore called Island Books is a faded sign with the motto “No Man Is an Island; Every Book Is a World.” A.J. Fikry, the irascible owner, is about to discover just what that truly means. A.J. Fikry’s life is not at all what he expected it to be. His wife has died, his bookstore is experiencing the worst sales in its history, and now his prized possession, a rare collection of Poe poems, has been stolen. Even the books in his store have stopped holding pleasure for him. These days, A.J. can only see them as a sign of a world that is changing too rapidly. And then a mysterious package appears at the bookstore. It’s a small package, but large in weight. It’s that unexpected arrival that gives A.J. the opportunity to make his life over, the ability to see everything anew. It doesn’t take long for the locals to notice the change overcoming him or for a determined sales rep named Amelia to see her curmudgeonly client in a new light. The wisdom of all those books again become the lifeblood of A.J.’s world and everything twists into a version of his life that he didn’t see coming. As surprising as it is moving, The Storied Life of A.J. 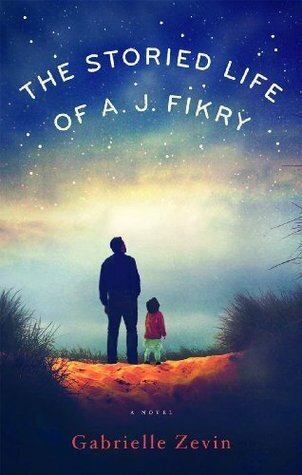 Fikry is an unforgettable tale of transformation and second chances, an irresistible affirmation of why we read and why we love. I love when I find a quick read that leaves an impact on me, and that is exactly what The Storied Life of A.J. Fikry has done! It was charming and adorable and it made me feel so warm and cozy. You can tell that the author loves books and anything bookish, and this book truly read like a love letter to book lovers. As soon as I saw the words ARC and galley, I was instantly won over. The book is set in a bookstore so you know I was destined to love it! The characters were all very interesting and dynamic, and it was a joy getting to know them. I loved reading about A.J. Fikry’s character development and seeing how his life is slowly enriched. I really thought that Maya was a sweet character and I was happy we got to see her childhood, but there were things that she said that I thought sounded like they were said by a character way older than her and it took me out of the story a little bit. The Storied Life of A.J. Fikry ended up being a charming yet heartbreaking book that deals with life after grief. If you loved A Man Called Ove I think that you will also really love this book! I will now read every book by Gabrielle Zevin. I love the covers to all three of these! Glad to hear you at least enjoyed on some level each one of these! They covers are definitely all gorgeous! I am happy I read all three of these! I had Little Fires Everywhere out from the library for three whole months and still didn’t read it. I’ve seen too many review like yours, and there are too many other books I want to read right now. I’ll get it it at some point, but…eh. Not right now. I did like A Long Way to a Small, Angry Planet though! I personally wouldn’t rush to read Little Fires Everywhere if there are so many other books that are more interesting to you. I am happy I read it because of the TV show but it’s not a book I think is a must read! Aww man. I really liked Little Fires Everywhere, but I totally understand where you’re coming from on your critique of it. I certainly agree that some characters could use more dimension and I thought some occurrences were a bit too obviously convenient to help the plot along, but I liked how the story was written and that I felt compelled to return to the book whenever I took a break from it. The Storied Life of A.J. Fikry is one I really need to read. Little Fires Everywhere is one of those books that even as I was ready it I was thinking that I totally understood why so many people love it! The reasons it didn’t work for me are definitely just a me thing. It was really well written! I really enjoyed Little Fires Everywhere but I can understand why you might not have as much! I really like how Celeste Ng writes character driven books to explore familial ties, although I did like her book Everything I Never Told You more than LFE. I do think it’s gonna make an amazing miniseries, especially if Reese Witherspoon is producing it! I completely understand why so many people love LFE! I just do not connect with her characters for a reason I can’t quite out my finger on! I will definitely watch the show though. I think it’s going to be great! I don’t usually read Sci-fi but The long way to a small angry planet looks appealing and as you say it might be good for newbies to the genre I might look into sneaking it to my TBR pile! Great reviews! It’s the perfect book for that! I have been recommending it to everyone- SciFi fans or not! Thank you! I really want to read The Storied Life but generally felt the same way about Little Fires Everywhere. I do think it will be a great adaptation though! I don’t know if Witherspoon is going to play her but Elena did strike me as a grown up version of Tracy Flick. I agree! It think its going to be a great show! I adore Reese Witherspoon and I am also a big fan of Kerry Washington so I can’t wait! I did not know that Reese Witherspoon was producing a Little Fires Everywhere mini series! I will of course watch it, however I have to admit to being pretty let down by the book. It took a LONG time to pick up for me, to the point where I feel like the first half of the novel was kind of irrelevant (and the characters lacked depth throughout it too). The second half picked up the pace for sure, but I almost feel like it was too rushed and that the plot could have started earlier. I have the exact same feelings about it, but I am still excited for the mini series! I am hoping it translate better that way! I really liked Little Fires and Mia was one of my favourites 🙂 Mrs Richardson was quite annoying and i saw no improvement on her as the story progressed. In a way i find that realistic as most people don’t bother to change. I loved Guardians of the Galaxy so I’m quite willing to give TLWTASAP a chance! I wasn’t too sure what it was about when I first saw it going around the blogosphere but I love a good sci-fi, and especially one that is funny and not overly serious and… Well, scientific. A sense of humor will always win me over. Thanks so much for sharing, Kristin! Yes! I think you’ll absolutely love it! I adored A J Fikry, and I have the other two on my pile of books to read this fall. Glad to hear you thought highly of all three! Awesome! I hope you enjoy the other two books as well! Great selection of books. I’ve been meaning to pick up Little Fires Everywhere for a while, and I’m so sad to hear you didn’t like it that much! 😦 Even so I still hope to read it soon, especially cause I also enjoy reading unlikeable characters. I still think it is worth reading, especially since it is going to be a miniseries! I am interesting in seeing what you think about it! I’ve never heard of “The Storied of A.J. Fikry”. I will definitely have to add it to my Goodreads list! Yay! It is so great!